This study is the first of a suite of projects aimed at understanding the value of VET delivered to secondary school students for their post-school employment and training destinations. Statistical analysis presents the quantity and type of VET programs undertaken by students in secondary schools, and a content analysis of selected training packages explores non-technical skills. The aim is to understand how VET can equip the students with the technical and non-technical skills to participate in an ever-changing world of work. It identifies the presence or absence of key non-technical skills within the content. The role of vocational education and training (VET) in preparing secondary school students for employment, further training and the changing world of work has long been a topic of interest among employers, educationalists and policymakers. More recent attention has also been on VET’s role in assisting in the development of non-technical skills (for example, employability skills), with employer groups vocal about the need for potential employees possessing these skills. This study is one part of a larger program of research investigating whether VET programs delivered to secondary students add value to their post-school destinations. In this report, we explore whether VET undertaken by secondary students, and in some cases by post-school students, equips them with the skills (including the non-technical skills) required to successfully participate in an ever-changing world of work. To do this, we analysed the VET programs of secondary students over the last 20 years, focusing on the number and types of programs undertaken and the characteristics of the participating students. We also undertook a content analysis of the core units of qualifications in selected training packages to identify whether these facilitate the development of non-technical skills. Data on the numbers of secondary school students in these programs from 2003 onwards have been provided to the National VET in Schools Collection by the jurisdictional boards of studies, and these form the underlying data used in this report. Due to definitional issues and reporting pathways, these data are likely to underestimate the total number of secondary school students undertaking VET programs. Participation in VET programs by secondary students over the last two decades has trended upwards (from 60 000 in 1996 to over 240 000 in 2017). The number of Indigenous students has also increased substantially (from 5500 in 2006 to 14 639 in 2017); the proportion of Indigenous secondary students nearly doubled (from 3.2% to 6.0%). Over the last decade, participation rates of all students have hovered around 30% (noting this is likely to be underestimated), with the rates of students from government schools continuing to exceed those of students from non-government schools. There has also been a continuing upward trend in more recent years of students undertaking certificate III qualifications. In 2017, there were around 18 000 more male secondary school students than females undertaking VET programs. However, proportionately more females were enrolled in certificate III qualifications and above; the converse was true for certificate II qualifications. The most popular certificate III programs for females and males were in the occupational and study areas traditionally dominated by each gender: the provision of caring, business, hospitality and beauty services for females; and information technology, trades, sport, fitness and recreation for males. The most popular certificate II qualifications where males outnumbered females were in vocational preparation programs and trade skills development. In addition to preparing students for the world of work, secondary schools have a range of educational, social, cultural and personal development goals and these may sometimes run counter to the industry-specific skills required by industry for VET programs. Analysis of relevant units of training packages selected for examination found many examples of competencies and content being taught to secondary students undertaking VET that would enable them to develop key non-technical skills. Additional exploration of the data and research is required to determine whether there are differences in the further education and initial employment outcomes between secondary students who undertake a VET program and those who do not, all else being equal. Vocational education programs delivered to students in secondary schools, historically called ‘VET in Schools’ programs (COAG Education Council 2014), were established with the specific aim of enabling students to undertake both nationally accredited vocational education and training (VET) programs (including part-time apprenticeships and traineeships) alongside programs that enable students to complete their senior secondary certificate of education. Such programs lead to nationally recognised VET qualifications. Today these programs are referred to as ‘VET delivered to secondary school students’, signifying that they are the same as all other VET programs (COAG Education Council 2014). In 1996, school-based apprenticeships were also introduced for secondary school students undertaking VET. These involved the students starting a part-time apprenticeship while still at school and receiving payment for that part of their time spent in the workplace. From the perspective of industry, one of the key purposes of VET (including in secondary schools) is ensuring that students develop the generic and industry-specific skills and knowledge required by industry for its potential workforce. For schools, such labour-market purposes are not the only reasons for secondary schools supporting VET; they are also interested in helping students to develop knowledge and understanding of the world of work in general, explore a range of career options and progress through and complete their other educational subjects. The effectiveness of VET programs is an important policy issue because of the underlying premise that vocational education and training equips people with the skills to get a job or progress through a job. Moreover, the contributions such programs make to the uptake of the non-specific skills required for entry into employment and for participation in changing workplaces and occupations is also a significant area of interest and concern. To date, there has been little information on the longer-term outcomes of secondary school students who have undertaken a VET program. 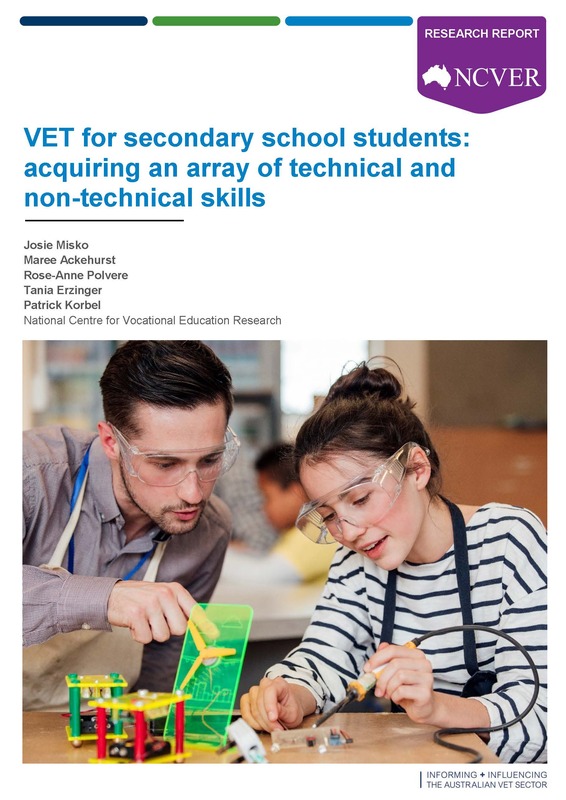 In this report we focus on the first phase of a project that aims to understand the value of VET delivered to secondary school students, especially for their post-school employment and training pathways. In this first part we provide a snapshot of the types of programs undertaken by students, as well as trends in participation. We also report on an investigation of the extent to which training packages assist in the development of non-technical or generic skills. To obtain a more comprehensive and up-to-date analysis of the uptake and offerings in VET undertaken by secondary school students, we describe the national trends in participation, the levels and types of qualifications undertaken by these students, and the qualifications that are on offer to meet changing industry and occupational structures. However, it is important to remember that the data on the numbers of secondary school students in these programs from 2003 onwards are provided to the National VET in Schools Collection (see appendix A) by the jurisdictional boards of studies. These data are likely to underestimate the total number of secondary school students undertaking VET programs. An analysis of existing data from the National VET in Schools Collection shows that the number of secondary school students undertaking VET has trended steadily upwards over the last two decades. In 1996, when new approaches to vocational education in schools were being adopted, 60 000 students were undertaking such courses; by 2006 this had increased to about 170 000, and by 2017 the number had increased to just over 242 000. In the last few years the pattern of steady growth has slowed; in 2014, 2016 and 2017 the numbers declined from the preceding year. In 2015 the numbers had reached over 257 000. The overall participation rate in the last decade or so has remained relatively stable, at around 30%, with participation rates for government school students being higher than those for Catholic and independent schools. In 2017, the participation rate for students in government schools, Catholic and independent schools stood at 36%, 26% and 17% respectively. This represented a very slight increase from the year before for Catholic and independent schools (one and two percentage points respectively) and a very slight decrease for government schools (by one percentage point). Between 2006 and 2017, the proportion of Indigenous secondary school students in VET programs almost doubled, from 3.2% to 6.0%; and in 2017 their participation rate by comparison with non-Indigenous students was also substantially greater. Queensland has the highest participation rates and since 2008 these have tended to remain around the 50% mark. Since 2013, Western Australia has had the next highest participation rates. Bearing in mind the likely underestimation of reported VET for secondary school students nationally, one of the reasons for the apparent relatively high participation rates for Queensland may be due to this state having the highest number of secondary schools that are also registered training organisations (RTOs), which are more likely to report all their VET activity. The number of school-based apprentices and trainees increased from 12 925 in 2006 to 19 961 in 2017. Queensland had the highest numbers in 2017 but when we take the number of apprentices and trainees as a proportion of all VET secondary school students, Tasmania had the highest proportion (albeit from a low base). In 2017, the most common qualification level undertaken by VET secondary school students was certificate II, followed by certificate III. While there are a greater number of enrolments in certificate II qualifications, since 2010 there has been a greater rate of increase in certificate III enrolments compared with certificate II enrolments. Between 2006 and 2017, there was a low uptake of certificate IV and diploma qualifications, although some minimal increases have occurred in recent years. In 2017, males were more highly represented in certificate I and II programs than females (68% and 59% respectively), while females were more highly represented than males in certificate III programs (38% and 29% respectively). Females were also more highly represented (by a very slight margin) in certificate IV programs (3% and 2% respectively). The most popular certificate III programs for females and males were in the occupational and study areas traditionally dominated by each gender; for example, the provision of caring, business, hospitality and beauty services for females, and information technology, trades, sport, fitness and recreation for males. The most popular certificate II qualifications where males outnumbered females were in vocational preparation programs and trade skills development. The most common training package qualifications undertaken by students doing VET in secondary schools have only changed slightly over time. In 2006, the Certificate II in Business was the most common followed by the Certificate II in Hospitality Operations. In 2017, the Certificate II in Hospitality was the most common qualification, followed by the Certificate II in Business. In 2006, the Certificate II in Information Technology was the third most popular, but in 2017 this position was taken by the Certificate II in Kitchen Operations. The fourth most popular program in 2017 was the Certificate III in Sport and Recreation, followed by the Certificate II in Construction Pathways. 19-year-olds across the sectors. We found that post-school VET students were more likely to be undertaking certificate III and above qualifications and VET students in secondary schools were more likely to be undertaking the lower-level certificates. The most popular field of education for 15 to 19-year-old secondary school students undertaking VET in 2017 was society and culture, followed by management and commerce; and food, hospitality and personal services. For 15 to 19-year-old post-secondary school VET students, the order changed, with engineering and related technologies occupying first place, followed by architecture and building and then by food, hospitality and personal services. It’s not surprising that 15 to 19-year-olds in post-school VET are more likely to be undertaking certificate III qualifications, especially as they may already have undertaken lower qualifications during schooling. In addition, it is more difficult for VET students still attending school to undertake many certificate III programs because of the school’s limited capacity to provide these programs. non-technical skills required to enter modern workplaces. understanding the trajectories of students in secondary schools who undertake VET but move into university programs: understanding the connections between the VET qualifications undertaken at school and those pursued at university may provide insights into how school VET programs benefit or impact on a student’s choice of university study. We base the comparison on post-secondary 15 to 19-year-old students in government-funded training.